4.0 Kilo per square meter hand woven traditional flokati rugs, available in rectangles and rounds in natural off-white, Flokati Rugs are a plush and soft shag rug and with a natural beauty suitable for any decor. 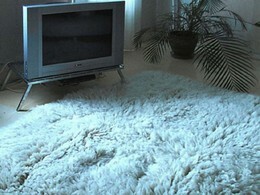 Flokati is a hand crafted wool shag rug that is made from the finest wool for elegance, comfort and durability. 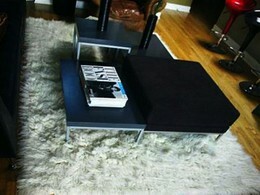 The Flokati wool shag Rug is beautiful, durable and luxurious. Imported from Greece, and made from 100% New Zealand Wool, these 4.0 kilo Flokati rugs are approximately four inches in pile height. Flokati rugs are naturally stain and soil resistant. The high moisture content of the fiber, along with wool's protein constituents, gives Flokati rugs excellent flame resistance too. Small rugs can be machine washed in cold water with Woolite and air dried. Larger rugs can be washed and dried outdoors or professionally washed .The flokati rug is known for it?s amazing durability and a quality flokati can last with moderate traffic for as much as 25 years if properly cared for. With this Flokati rug, you can be assured of unsurpassed comfort and luxury. Nothing compares to the luxuriousness and durability of wool. 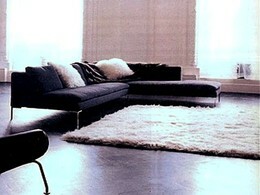 A Flokati wool rug is naturally beautiful, luxurious and comfortable. Wool breaths and is static resistant, and their durability is unsurpassed by other natural fibers and woven wool alternatives. The structure of wool allows the body to be supported by resilient and springy fibers, providing support and comfort. And a wool is a great insulator. Wool traps air, which insulates you against cold and heat. These 4.0 Kilo Flokati Rugs are available in designer colors, and Custom Flokati Rugs are available in any color, shape or weight. Please call us at 877-LOVE RUG to discuss your custom Flokati Rug Needs.